Blodgett has over 160 years of experience in manufacturing commercial cooking equipment. 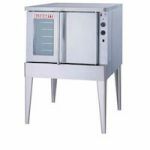 They offer high-quality convection ovens, kettles, combi ovens, deck ovens and more. Blodgett is committed to continual innovation, including advancing cooking technologies in order to create cooking equipment that accomplishes its task while being user-friendly and energy efficient. Both new and time-tested cooking processes and techniques are incorporated into their equipment, so that you can provide consistent results to your customers.